Hispanic LGBT community – Culture, Heritage, the Arts, Food, Music, Literature, Education, Family, Health & Wellness. continue to grow interest, attendance, and brand loyalty. Our event covers demographics in every age category, orientation, ethnic & economic bracket. Latino|Hispanic LGBTQ community – The only organization of its kind since 2002. Hispanic Heritage Month & Celebrate ORGULLO all starts with a big party –our LEGENDS BALL! celebrates the good, positive & outstanding within our LGBTQ & ally community. Betsy South Beach hotel – these free concerts are a hit with all who attend. Meet local, national and international authors, and enjoy a personal journey of their story, writings and life. Set in intimate salons, meet your favorites, or make new ones. Get behind the scenes VIP tours with amazing artists and their works! local artists who have achieved international acclaim – all while having a great travelling weekly party. each evening will benefit our LGBT College Scholarship fund. All in-kind Sponsorships are valued at 50% of Sponsor Level. Tax deductions available for Sponsorships to extent of the Law. PRESENTING SPONSOR – $35,000 . • 4 tickets to ESCRITORES|Writer’s Salon & Private Lunch with the author. • 4 VIP tickets to Noches de JAZZ at the BETSY South Beach, with comp. bottle of bubbly! • 4 VIP tickets to ARTISTS STUDIO & SABORES Traveling Party & private meeting with the artist. • 2 tickets to ESCRITORES|Writer’s Salon. • 2 VIP tickets to ARTISTS STUDIO & SABORES Traveling Party & meet the artist. • 2 tickets to ESCRITORES|Writer’s Salon & Private Lunch with the author. • 4 VIP tickets to Noches de JAZZ at the BETSY South Beach. WHO ARE Celebrate ORGULLO ATTENDEES? 14.8% MONROE, BROWARD & PALM BEACH COUNTIES . 13.8% ELSEWHERE IN U.S. .
34.4% $25,000 To $65,000 . 5.2% $65,000 TO $105,000 . All Sponsor logos will appear according to level of Sponsor commitment. In kind valued at 50& of cash value. throughout the year, as well as customized programs for corporations, community groups & educational institutions. We are proud to be CERTIFIED by the Florida Board of Clinical Social Work, Marriage & Family Therapy and Mental Health Counseling. awareness, nurture aspiring artists & enlighten all about the many layers of the transgender community. honor outstanding community leaders with our LEGENDS MEDAL at the event. The Ball is also our kick-off event to Celebrate ORGULLO. is free and open to the public, and proceeds benefit our LGBT Scholarship Fund and year round programming. ARTS, DESIGN or EDUCATION, along with a Jr. board position at UC|CU, every year. & the Anita Priest LGBT College Scholarship (…PRESENTED BY). • VIP tickets & Priority Entrance to all UC|CU Events. • Weblinks & regular e-blasts. TRANSART and the Anita Priest LGBT College Scholarship (…SPONSORED BY). • Preferred List on all tickets & Events. • Priority List on select tickets & Events. provides a scholarship for the LGBT community to advance their education in the area of Design & the Arts, and Education. - You must be a resident of the U.S.
- Submit a completed and signed application. - Recent photo or digital photo in jpg, gif, or bmp format, and a scan of Driver’s License/State Issued ID. - Most recent academic transcript to be sent by the school by e-mail or by mail. - At least two and no more than three letters of recommendation, including references to your academic work. - Winning applicants are awarded a $2,500. Scholarship for tuition expenses related to Design, the Arts or Education, paid directly to the school. Scholarship applications are available every January, and awards are announced in March. $10,000. + | Scholarship Presented By recognition, co-host at our Scholarship Reception & VIP at our LEGENDS BALL Gala. $5,000. | Name & logo recognition as a donor, and participation in our Scholarship Reception. conscious & loyal consumers. Fee $30. • Lead name & Logo listed on all Ads, Promos & Press Releases. • Listing on website with weblink. • 6 Social Media promos with name & logo. • 2 tables at event. • 10 VIP tickets to event. • 4 banner placement opportunities at event. • Donation is tax deductible to the extent of the Law. ASSOCIATE SPONSOR | $ 2,500. • Name & Logo listed on Ads, Promos & Press Releases. • 4 Social Media Promos with name & logo. • 1 table at event. • 5 VIP tickets to event. • 2 banner placement opportunities at event. SUPPORTING SPONSOR | $ 1,000. • Logo listed on select Ads, Web & Promos. • 2 Social Media Promos with name & logo. • 2 VIP tickets to event. Proposals & value considered, based on presentation & value. the general population about the many layers of the transgender community for the first time in So. Florida’s rich cultural history. Town Hall; Artists Showcase, Youth Mentoring Day, a Health Symposium, & more. ASSOCIATE SPONSOR | $ 5,000. SUPPORTING SPONSOR | $ 2,500. LEGENDS BALL | Celebrating Greatness in our Community. LEGENDS MEDAL at the event. The Ball is also our crowning event to Celebrate ORGULLO Hispanic PRIDE Month of events. Expected attendance is 300+. LGBT friendly, conscious & loyal allies. $100. • Lead name & Logo listed on all Ads, Promos & Press Releases (…PRESENTED BY). • 2 VIP tables at event. • 1 VIP table at event. 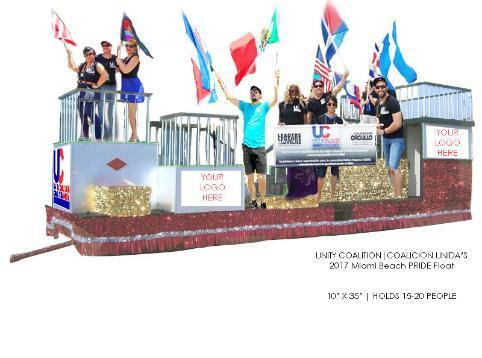 Celebrating its 7th year, Miami Beach Gay Pride boasts over 150,000 attendees each April in Miami Beach. ASSISTED | 450+ people to much needed healthcare, housing & legal assistance. AWARDED | 5k for LGBT College Scholarship programs in the Arts, Design & Education. SHOWCASED | 80+ artists, writers, dancers, performers & community leaders in year round programming. Story Corps, SunServe, University of Miami, Whispering Angels Foundation & more, to produce programming & services. community since 2002, advocating for Equality, Education & Fairness. community – with YOUR HELP.